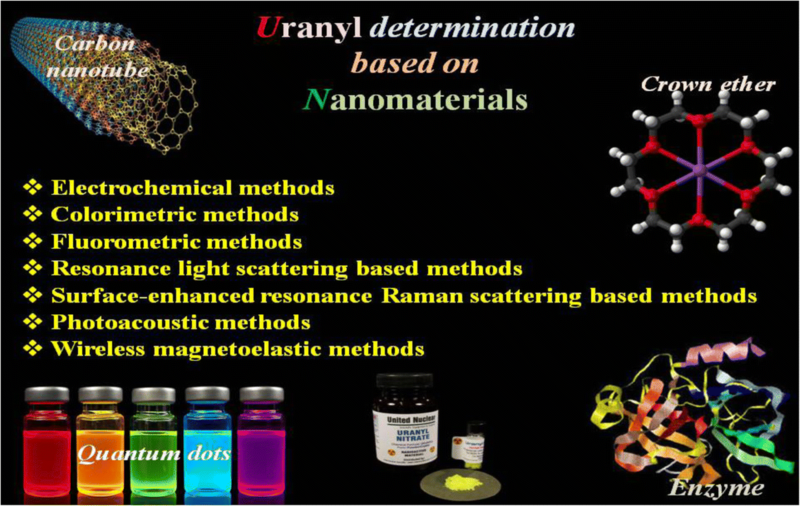 This review (with 177 refs) gives an overview on nanomaterial-based methods for the determination of uranyl ion (UO22+) by different types of transducers. Following an introduction into the field, a first large section covers the fundamentals of selective recognition of uranyl ion by receptors such as antibodies, aptamers, DNAzymes, peptides, microorganisms, organic ionophores (such as salophens, catechols, phenanthrolines, annulenes, benzo-substituted macrocyclic diamides, organophosphorus receptors, calixarenes, crown ethers, cryptands and β-diketones), by ion imprinted polymers, and by functionalized nanomaterials. A second large section covers the various kinds of nanomaterials (NMs) used, specifically on NMs for electrochemical signal amplification, on NMs acting as signal tags or carriers for signal tags, on fluorescent NMs, on NMs for colorimetric assays, on light scattering NMs, on NMs for surface enhanced Raman scattering (SERS)-based assays and wireless magnetoelastic detection systems. We then discuss detection strategies, with subsections on electrochemical methods (including ion-selective and potentiometric systems, voltammetric systems and impedimetric systems). Further sections treat colorimetric, fluorometric, resonance light scattering-based, SERS-based and photoacoustic methods, and wireless magnetoelastic detection. The current state of the art is summarized, and current challenges are discussed at the end. 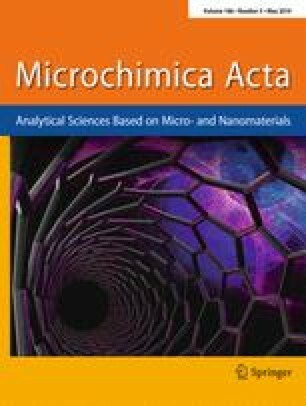 An overview is given on nanomaterial-based methods for the detection of uranyl ion by different types of transducers (such as electrochemical, optical, photoacoustic, magnetoelastic, etc) along with a critical discussion of their limitations, benefits and application to real samples. The authors greatly appreciate the support of this work by Research Councils of Nuclear Science and Technology Research Institute and Razi University.